Grow your web design business and improve your ROI with the help of 7th Media’s outsource web design team. We have qualified project managers, creative web designers and hard-core web developers to take care of your web design and development projects remotely, so you can focus on growing your customer base. Our extensive experience in crafting sleek, user friendly, responsive, and high quality websites for the past 7 years have led us to work as a preferred offshore web development partner of various digital agencies in the US, Australia and Singapore. 1. 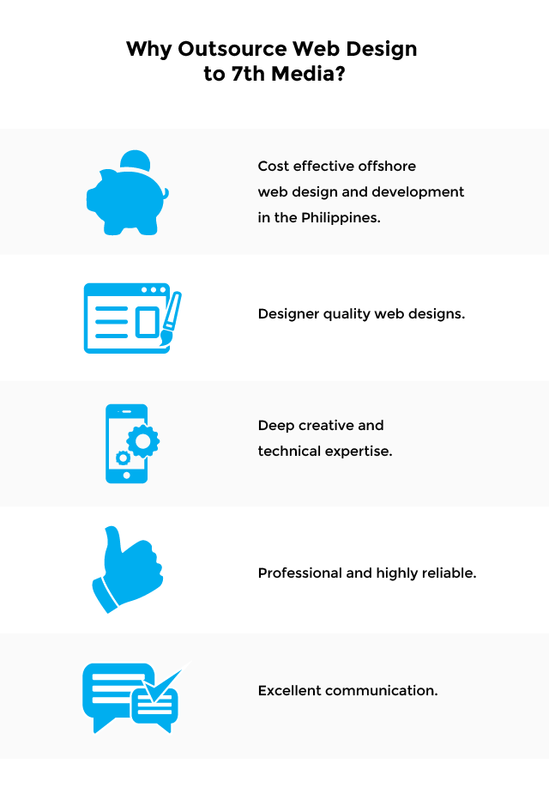 Cost effective offshore web design and development in the Philippines. With your in-house web design staffing budget in US, UK, Australia, Japan or Singapore, you are able to get highly competent and more offshore web designers in the Philippines to do your web design projects for you, enabling you to complete projects quickly at a fraction of your usual cost. 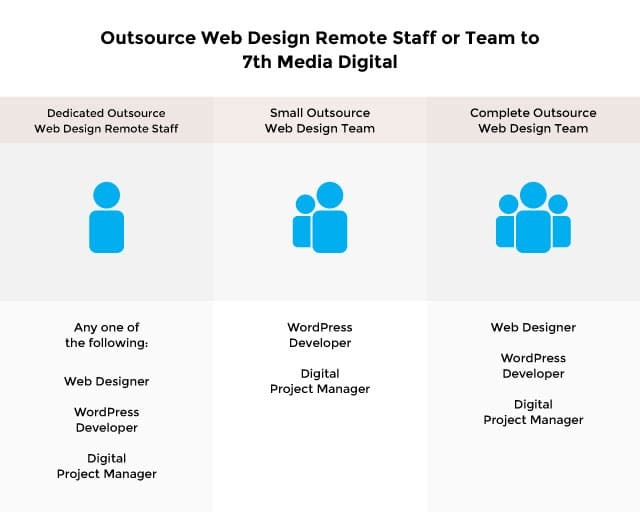 At 7th Media, we can be your offshore web design partner agency for your digital requirements either on a per-project basis or through a remote staffing arrangement on a monthly retainer contract. 2. Get designer-quality web designs. We create highly functional websites that look sleek and modern. We pay close attention to user experience, typography, colors and illustrations, making sure that everything blends well together to create web designs that are functional yet aesthetically pleasing. We also design with the client’s brand in mind to ensure that your branding is coherent across digital channels. 3. Receive both creative and technical expertise in web development. Web design and web programming are two different things and require two different skill sets. Whether you need a creative web designer to design a beautiful web user interface or a rock star web programmer to do heavy coding in your website’s content management system, we’ve got you covered! You can outsource your web design, web programming or your entire web development project to us, depending on your business needs. 4. Professional and highly reliable. Our team of project managers, web designers and web developers work hand-in-hand with you at each stage of the web development process, keeping you informed of the latest project progress updates and ensuring that you get the highest quality website within the agreed deadline. 5. Excellent communication. We understand that good communication is important when it comes to a project’s success. Our project managers, web designers and web developers are outstanding in written and spoken English, making it easy for you to communicate with us through e-mail or phone. Establish your own web design team in the Philippines. You can outsource your web design and development requirements to our team of web professionals on a per-project basis or on a monthly offshore staffing contract. A team comprised of a project manager, web designers and web developers will work to complete your website project on a set deadline as per your requirements. You pay per project. The project-based outsource web design solution will work for you if you are working on large projects that need a variety of specific creative and technical skills which you might not have in your team. For digital agencies with project overflows, you can easily outsource some of your web development projects to us in order not to lose out on business opportunities, without the need to beef up your in-house workforce. A single web professional or a team of project managers, web designers and web developers will be assigned to work for you 8 hours a day, 5 days a week on offshore basis. Your remote staff or team will be available by email, chat, phone or via your project tracking software so you can easily assign tasks and be updated on their work progress. You pay per month on a retainer basis. 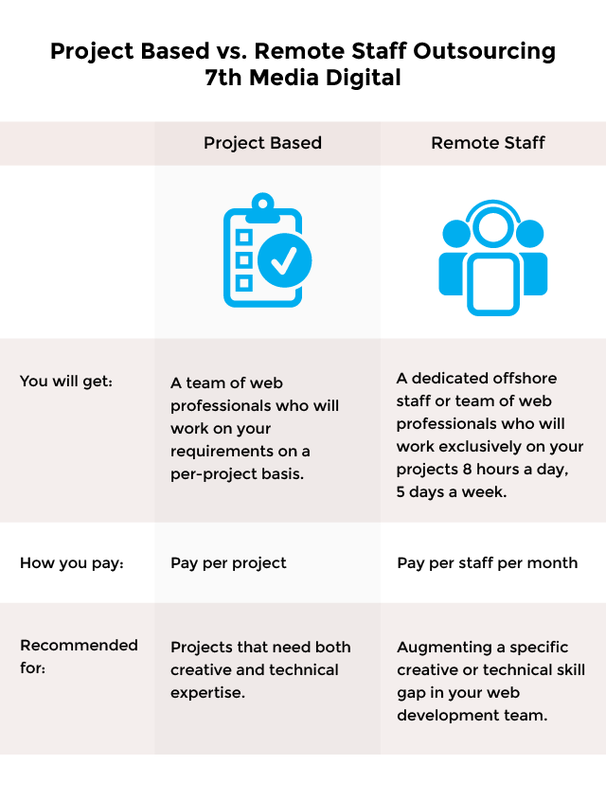 The Outsource Web Design Remote Staff or Team solution should be great for digital agencies looking to augment their existing workforce with offshore web professionals at cost-effective rates. An offshore web professional will be assigned to you to work on your projects remotely with your in-house team 8 hours a day, 5 days a week. You can have an offshore web designer, WordPress developer or a digital project manager depending on your staffing requirements. Your offshore web designer can create custom web designs, infographics, web banners, graphic designs, print illustrations and typography for a wide variety of industries. Your offshore digital project manager will supervise your web development projects and collaborate with web designers and WordPress developers to ensure that you get your projects done on time as per your requirements. The digital project managers will also ensure that your business requirements are met with the most suitable web technologies. If your digital agency is short of hands in terms of project management and web development, this solution should be perfect to augment your existing in-house workforce. If your digital agency serves as a marketing channel and would like to outsource your entire end-to-end web production operations offshore, the Complete Outsource Web Design Team solution will fit your needs. Apart from web design and development outsourcing, we also have talented graphic designers who can help you with your marketing collaterals for digital or print. If you have any questions about our web design outsource services or any other offshore staffing solutions, contact us and we’ll get the right solution for you.